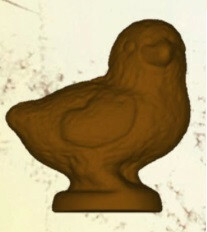 Polycarbonate mould for chocolate Chick. Dimensions of chick 78x68 mm. This mould has two cavities the front and back of the chick. Chick of 40 gr with a thickness of 2,8 mm of chocolate.